As with most recipes, you will have greater success if you read through the entire recipe before proceeding. Make the parts in advance so on baking day, everything is ready. 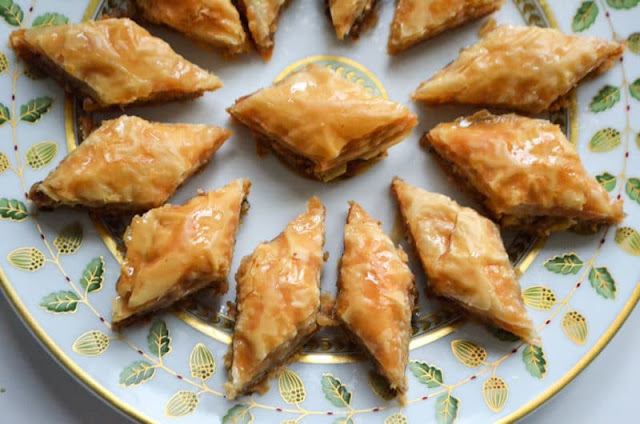 Start thawing the phyllo the day before you plan to bake the baklawa, in the refrigerator. Two hours before baking, bring the phyllo to room temperature. The syrup can be made weeks in advance and chilled in the refrigerator, but best to start at least a day ahead so it gets good and cold. Watch my how-to-baklawa video here. Make the syrup in advance so it can be fully chilled. In a small saucepan, combine sugar, water and lemon juice and bring to a boil over medium high heat. Reduce heat to low and simmer for 5 minutes. Add the orange blossom water. Pour into another, heatproof, container and cool completely. It is essential to pour cool/room temperature syrup over the hot pastry when it comes out of the oven. Make the sugared nuts: The nuts are ideally ground in a hand grinder, but they can be coarsely chopped in the food processor using pulses, taking care not to go too far. Some nut-dust is unavoidable, but it is better to have a few nuts that need to be broken by hand than to process too much, which will produce nuts that are too finely chopped. Combine the toasted chopped walnuts and sugar stirring until all of the nuts are coated. Using a metal 13 x 9 x 2-inch pan, lay it over the phyllo to fit. Cut about an inch off of the short side of the phyllo so it will fit in the pan. It’s better to leave the phyllo just a hair larger than the pan because it will shrink when it bakes. Brush the bottom of the pan with clarified butter. Lay one stack of 20 phyllo leaves in the pan. Spread the nuts over the phyllo in one even layer. Open the second sleeve of phyllo and trim the same way as the first sleeve. Lay the second stack of 20 leaves over the nuts, taking care that the top layer is a sheet that is not torn. Take a layer from the center of the leaves for the top layer if necessary. Brush the top layer or two with clarified butter. Using the tip of a very sharp chef’s knife, cut the baklawa into diamonds by cutting six rows (5 cuts) lengthwise and ten rows (9 cuts) crosswise on the diagonal. For slightly smaller pieces, cut 7 rows (6 cuts) lengthwise. Lightly score the top with your knife before diving in so you can see where the cuts will be. Use your dominant hand to cut and the other hand to hold the top layers of phyllo down while cutting, and be sure to cut all the way through to the bottom of the pan. This is essential so that the butter will seep through all layers. The knife is held almost perpendicular to the pastry, cutting straight down into the phyllo and nuts. The top layer will lift and in general make you want to curse as you cut, but just lay the phyllo back down where it belongs and move on. The sharper your knife, the easier the cutting will be.